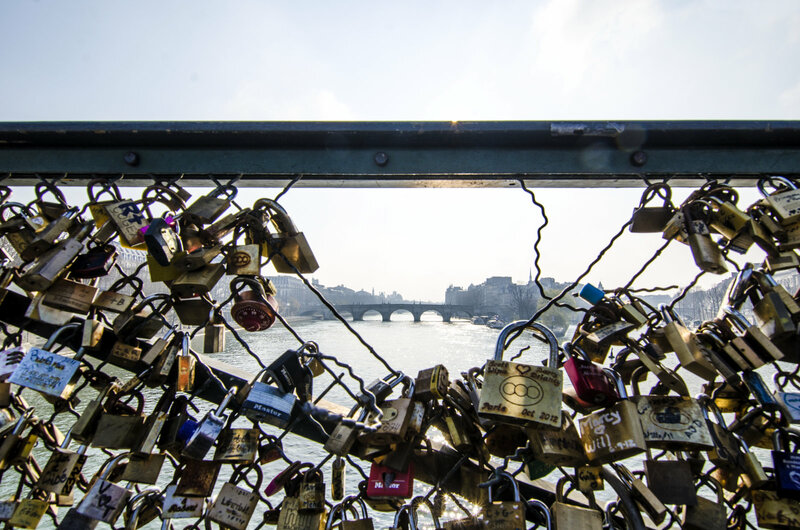 The love lock craze is not exclusive to Paris. Similar padlocks can also be found on fences and bridges in Rome, Moscow, Prague, Brussels and Mount Huang in China. It is unclear who started the fashion. Italians claim it was sparked by the romantic novel I Want You by Federico Moccia and is merely a case of life imitating art. In Moccia's book the main characters attach a padlock to the Ponte Milvio Bridge in Rome, kiss and throw away the key. How chintzy can you get? Either the chain link broke because the locks were too heavy or someone broke it because they were no longer in love. I love this bridge, always visit it when in Paris. I couldn't agree more. I have always thought this was the silliest and in some ways, most destruction new fad. Fads seem to always come and go. But what I like is your photo -- how you framed the bridge. Nicely done! And so they cut the fence. I'm shocked! There may be hope, we see the proof. Out there is love's new bridge: Pont Neuf? Not bad actually, not bad! By the way Jeff, did you see I posted a little Save the date note for the next PDP picnic on May 5th! @jeff : LOL a good one. Funny to use locks to symbolize love, when to many people they represent tyranny and oppression. How about they keep the key and throw themselves in the river? I don't know, but I'm really curious to know actually! Kiki, I live in England,but I am Scottish. Perhaps living in this silly country has affected me. Only joking, the English are very nice, just like the French. Eric.... Thanks for getting over there... Not the prettiest bridge in Paris but maybe the coolest... But Paris... In the spring... What could be better ??? Well actually, now that you mention it, it's so cold in Europe at the moment that we barely think of spring! These locks are SO unthinking-sentimental, yet claim the right to take over public space. "Pour toi mon amour" ? I remember that poem. Hadn't heard it or seen it in ages! Thanks for posting! Sorry, punctuation went wrong in introducing the Prévert. Can you fix for me, Eric? merci! It should read: Is there room for Prévert's "Pour toi mon amour" ? Yes, Eric, I saw the picnic post. Excellent!
" They don't just toss them in the Seine, do they?" I surely hope they don't! I've been commenting on your blog via FB and tonight see you've changed your blog layout. I like it. I also love the bridges in paris and was a champion for the locks. Now...not so much. They are too much I think and there are the lock vendors ......and well it's overdone and just too much. I hate it when commercialism ruins MY Paris. :) Love you POV though.
" They are too much I think and there are the lock vendors" Interesting, I never thought of that LOL. Let's hope the safe vendors don't have the same marketing plan! Eric, this is a superb shot. And also it may mean that it's time to stop harassing that poor bridge and find another use for these locks. Someone commented on the Ville de Paris's site that maybe we could recycle the locks and keys into a giant heart or something like that and it sounds like a great idea to me. We could put notices on the bridge that say the locks are no longer allowed due to damage to the infrastructure, but please deposit your locks and keys in those two receptacles (one for the locks, the other one for the keys) for the new art project (maybe make a giant heart and stick it somewhere in the Tuileries or La Defense or something like that.) How about it?